It may seem strange that a gutter installation company would be writing an article on “How to maintain gutters and down-spouts” when we are in the business of installing them. We have been in business for over 30-years, serving the greater Puget Sound area from Olympia to Tacoma and as far north as Seattle installing gutters for hundreds of homeowners and investors like you. It is with no surprise that we have seen it all. We have seen every type of professional to non-professional repair in the hopes to draw out the life-span of one of the most overlooked functional pieces that protects your roof and property—GUTTERS. Therefore, we want to make sure that you are given tips on maintain both aged and new installed gutters for any season. It’s all about the investment and maximizing the life-span of any product. Maintenance of your roof and gutters system can save you lots of money on repair costs. When water is draining properly, it’s channeled away from your house, but if you have problems like clogs of leaves or holes rusted through, you gutters can direct water directly down to your foundation. Running or standing water there can cause all kinds of damage, from mold, stains to even cracks and worse erosion. Inspect your downspouts and gutters about twice a year. Carefully examine them in the spring just before the spring rains. Inspect them again in the fall when leaves, limbs and other debris might cause problems. Improper drainage due to poor roof pitch is one of the biggest causes of roof drainage problems. Improper drainage causes water to accumulate in certain spots in the gutters, ultimately building up debris and accelerating rust. 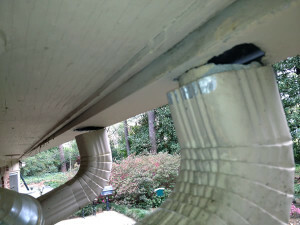 Clogged gutters and downspouts can also be a big problem. 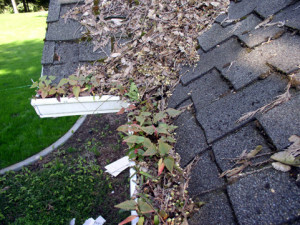 Thoroughly clean all debris from the gutters and downspouts at least twice a year. If there are a number of trees near your home, clean the gutters with a whisk broom even more often than twice a year. Rust can be a big problem. Keep the gutters properly cleaned and the pitch set correctly to slow down the rusting process.